Prototype: Three (3) different FS Trenitalia freight cars. 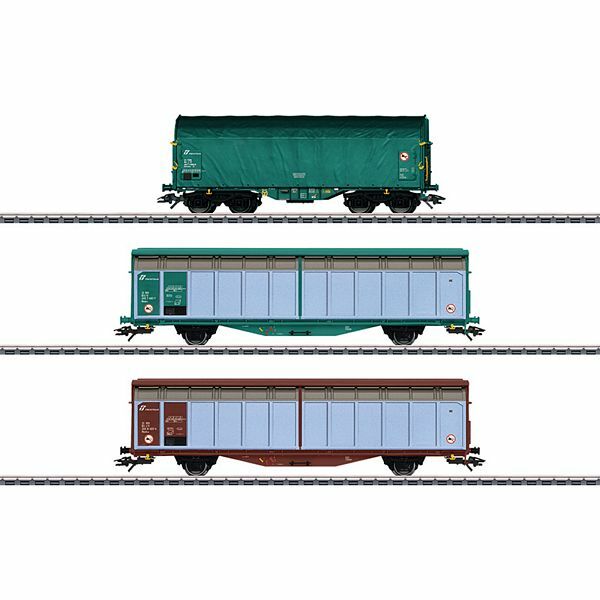 Two (2) type Hbbillns sliding wall boxcars in different paint schemes and a type Shimmns sliding tarp car. Model: The sliding wall boxcars have separately applied steps. Length over the buffers 17.8 cm / 7". The sliding tarp car has a closed tarp and a hand wheel for setting brakes on the car from the ground. The car has type Y 25 trucks. Length over the buffers approximately 13.8 cm / 5-7/16". All of the cars are individually packaged. Length over the buffers approximately 49.5 cm / 19-1/2". DC wheelset E70 0580. An electric locomotive to go with these cars can be found in the Märklin H0 assortment under item number 36658.